Alain Durand, Principal Technologist at Internet Corporation for Assigned Names and NumbersAlain Durand, Principal Technologist at Internet Corporation for Assigned Names and Numbers, visited Georgia Institute of Technology last week for a talk on the global adoption of Internet Protocol version 6 (IPv6). The Internet Governance Project organized the talk in cooperation with Atlanta's Technology Development Center (ATDC) and the Institute for Information Security and Privacy. IPv6 is the IETF-defined replacement for IPv4, the address space protocol that largely underlies Internet communication today. Durand, who was involved in the IPv6 standardization efforts at IETF back in the early to mid-1990s, offered a clear eyed assessment of the protocol's critical flaw, the lack of backward compatibility with IPv4. Instead of extending the IPv4 address space, IPv6 took a different approach requiring the eventual migration of all Internet connected devices and users to an entirely distinct and much larger address space. According to Durand, people didn't bother to adopt it because they had to run both protocols to stay connected to everyone on the Internet. In effect, running IPv6 and IPv4 added costs but added no value to the IPv4 Internet — no value, that is, until everyone adopts and we can turn off IPv4 and benefit from the larger address space. As Durand put it, the transition to the new standard created a "last-mover advantage." We are now more than twenty years into that prolonged transition. Looking at various sources of IPv6 adoption data, Durand's presentation made it clear that some countries, e.g., the US and India, are pushing forward at a good rate. In those countries and some others, the data optimistically reveals adoption rates between 20% and 40%, some with upward trends. But of concern are other countries that have 1) either not even started adopting, or 2) are plateauing at low levels not typically seen in new technology adoption. Among other curiosities, the data shows low adoption in places where one might expect substantial growth (e.g., Asia, northern Europe) and vice-versa (e.g., Greece is among the highest adoption in Europe). 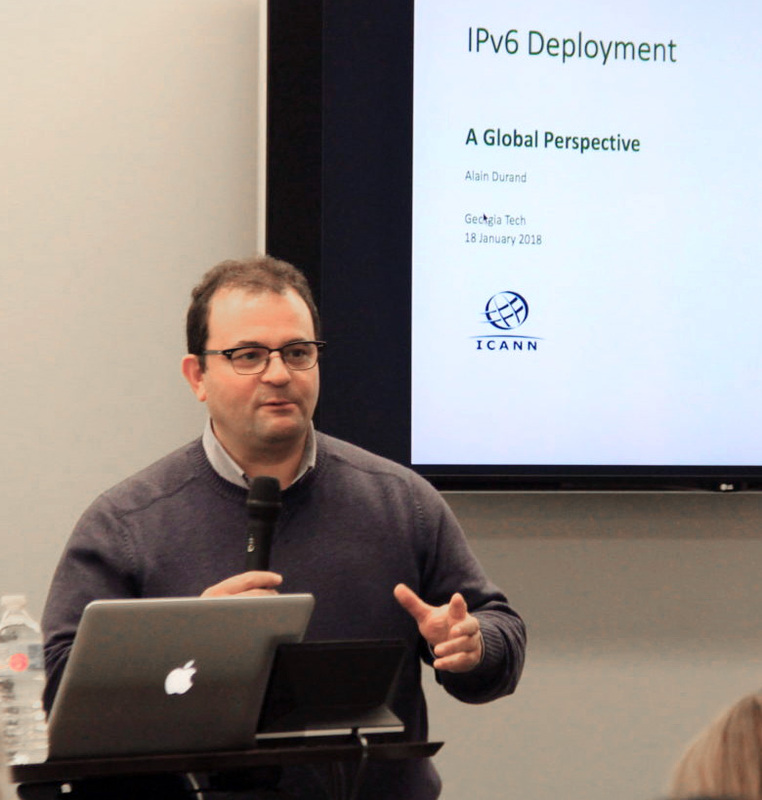 Durand suggested that, despite bridging technologies like network dual-stacking and multi-protocol devices and sites, the network effects associated with IPv6 don't seem strong enough to overcome the installed base of IPv4. Something else, or a combination of factors, must explain what we are observing. Understanding what these factors are is important. In Durand's view, IPv6 is not being adopted globally nor at rates that are needed to promote Internet stability and prevent fragmentation. The observed imbalances could result in a situation where parts of the world with adequate IPv6 adoption decide to turn off IPv4 and lose connectivity to the rest of the world. The audience, a combination of GT undergraduates, faculty, and Internet entrepreneurs peppered Durand with a wide range of questions. 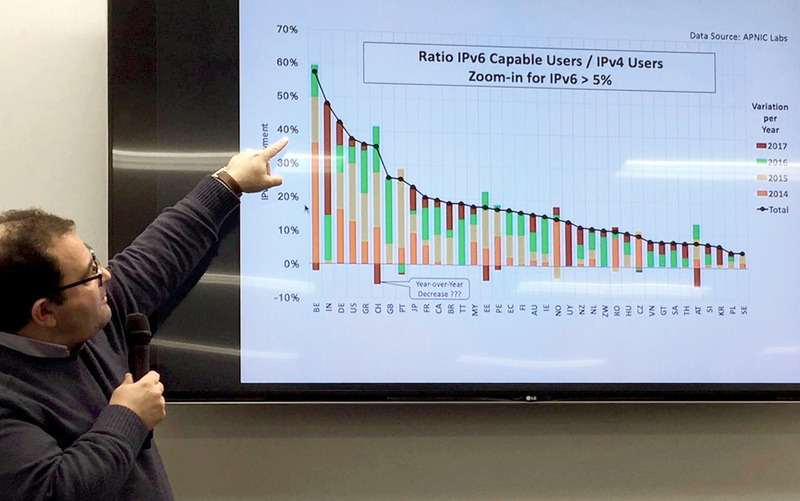 How are we actually measuring IPv6 adoption (both capability and usage)? What are the market characteristics where IPv6 adoption is/is not occurring? What is the relationship with consumer and other devices? What government or other policies are being pursued, what impacts are they having? One intriguing line of questioning wondered if the transition should be framed at a high level as a collective action problem. This does make sense. Transition to IPv6 confers substantial benefits to certain actors (e.g., wireless operators need to support rapid mobile growth), therefore they are willing to invest in and migrate to the new protocol. Other actors, e.g., end users in areas where the Internet is developing, might receive very little benefit from migrating, therefore, leading to free riding. This suggests that, among other possibilities, strategically finding ways to increase the network effects associated with IPv6, along with targeted subsidies to certain actors might be a policy prescription that could encourage migration. But there is much more to learn. Originally published in the Internet Governance Project. Anyone wanting to set up a web site is going to pass over a provider that only offers IPv6. So, all providers will still be sure they offer IPv4. Without a doubt, that continues the last mover advantage. But there are a small number of added content web host names that can only be accessed via IPv6, including in the adult content arena. The more this is done for the general audience, the more the last mover advantage is diminished. EzIP will not only resolve IPv4 address shortage issues, but also mitigate the root cause to cyber security vulnerabilities, plus open up new possibilities for the Internet. These should relieve the urgency to deploy IPv6. Feedback and comments would be much appreciated. Local Time: Saturday, April 20, 2019 07:23 PM PDT – Page Load: 0.3324 Sec.